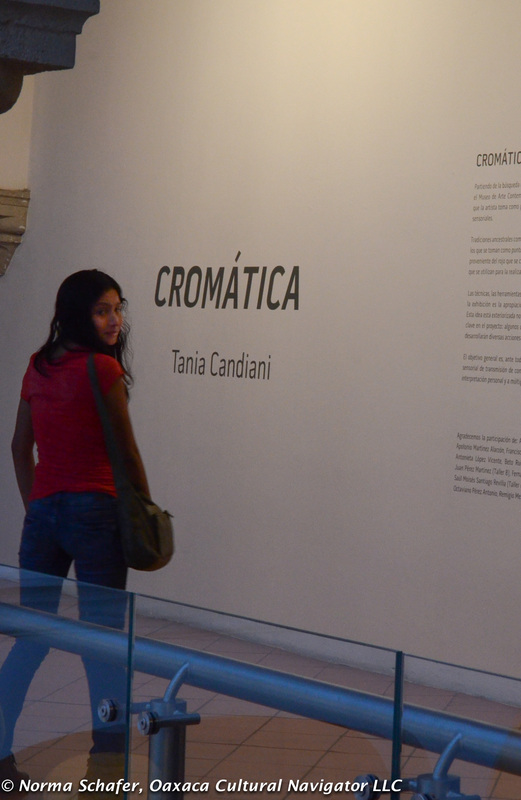 Chromatica, a multi-media art exhibition created by Guggenheim award-winning Mexican artist Tania Candiani, opened last weekend in Oaxaca at the Museo Arte de Contemporaneo de Oaxaca (MACO). The exhibition takes a new approach to sight and sound. Chromatics is about how we communicate through music and color. It can be considered the interdisciplinary intersection between technology and art. 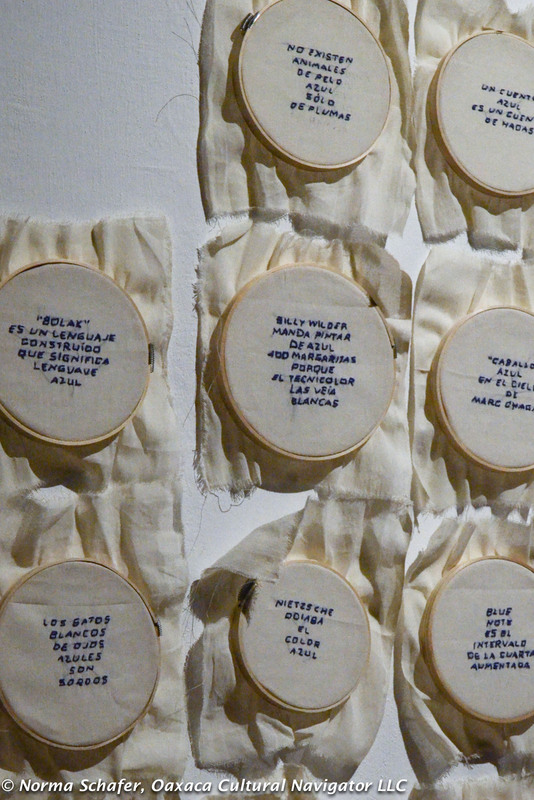 Candiani explores the differences and similarities between language systems, sound and the logics of technology through her work. 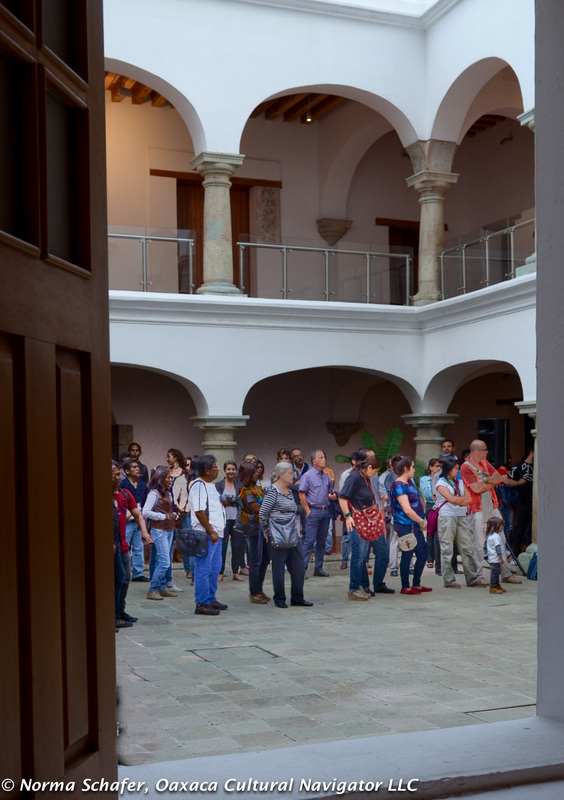 This is interpretive, intuitive and not always “in your face” evident through the various experiences of this exhibition that stimulates and questions the visual and auditory senses. The result is to create an emotional experience that could be somewhat uncomfortable. 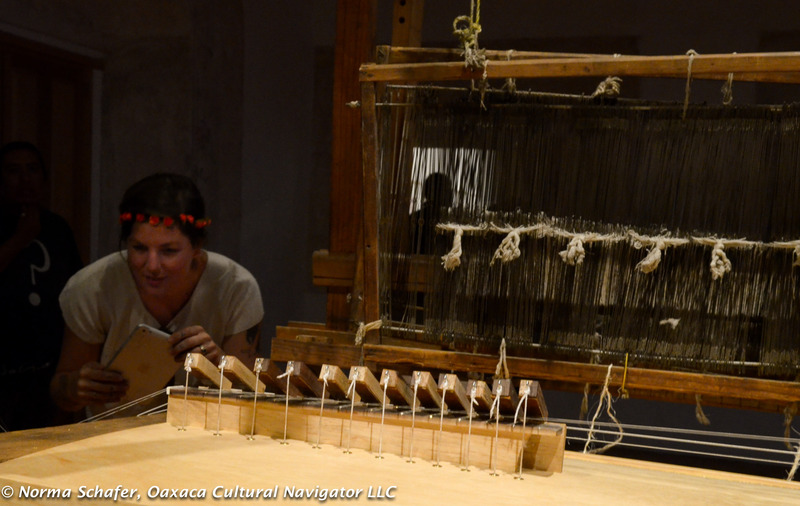 First is the sound of the traditional two-harness pedal loom used to weave serapes and rugs in Teotitlan del Valle. 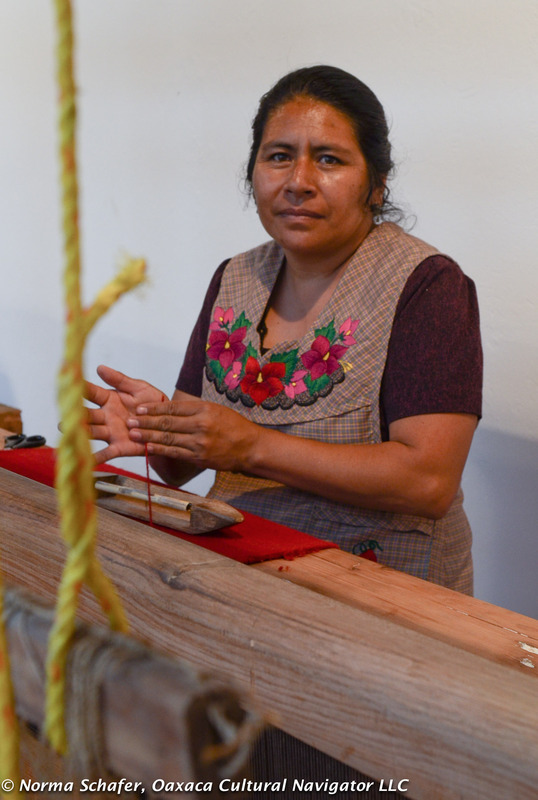 At the opening, three Mendoza family weavers stood at looms in the courtyard with microphones recording the sounds of their creativity. They wove fast, slow, in harmony and not. 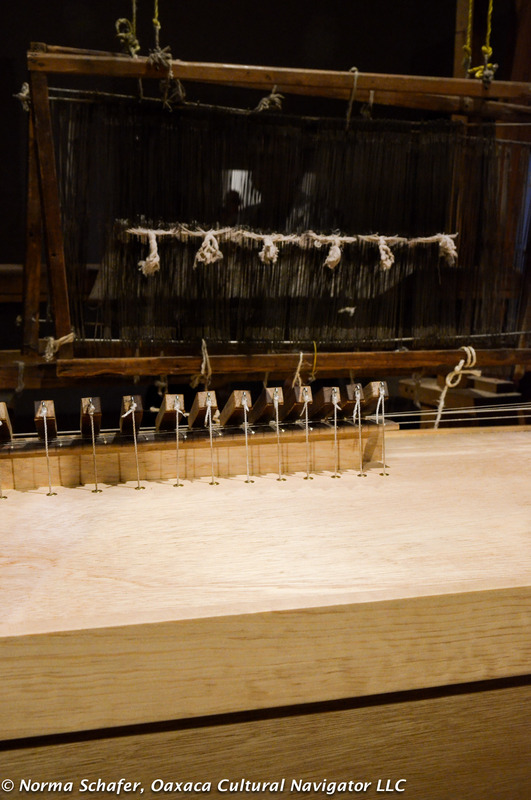 We could hear the beating of the treadles, loud, soft, harsh, subtle, the whoosh of the shuttle going through the heddles, the rhythms of wood against wool. 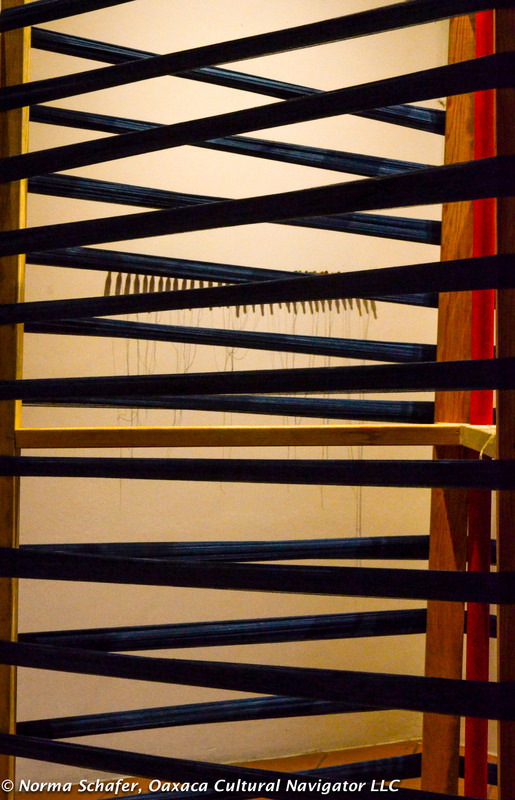 The recordings can be heard in one of the exhibition rooms along with an abstract video of the work in progress. For how much longer will we hear this sound? 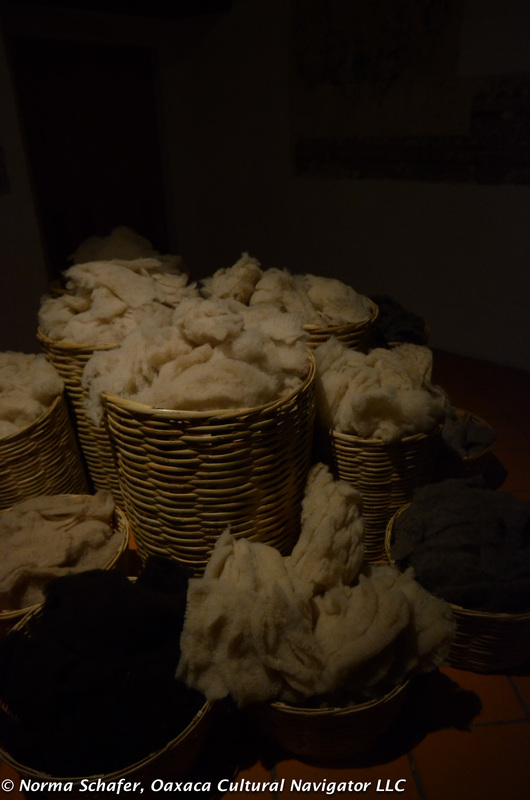 Upstairs on the second floor of the museum, we see the historical elements used to prepare the wool. The dyestuffs: cochineal, indigo and pericone (wild marigold). We see ancient stone grinders where people kneeled to prepare the powder. 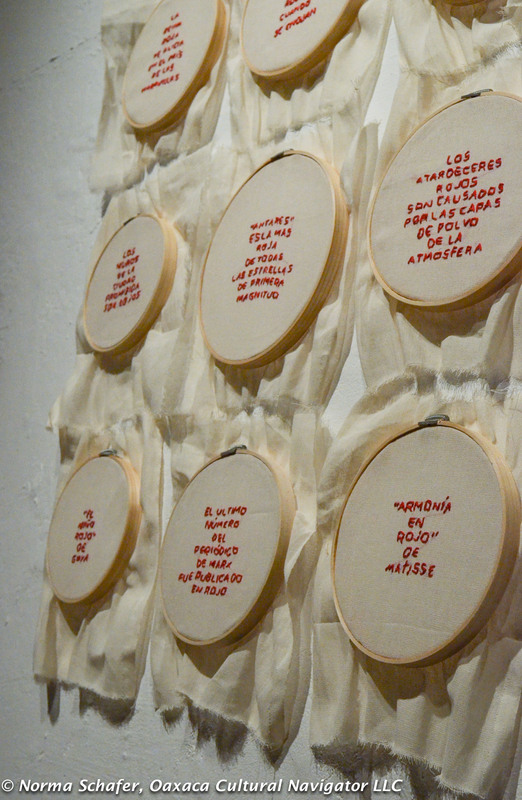 We see embroidery hoops embellished in red, blue and yellow, telling the story of the colors as recorded in the pre-Hispanic codices. 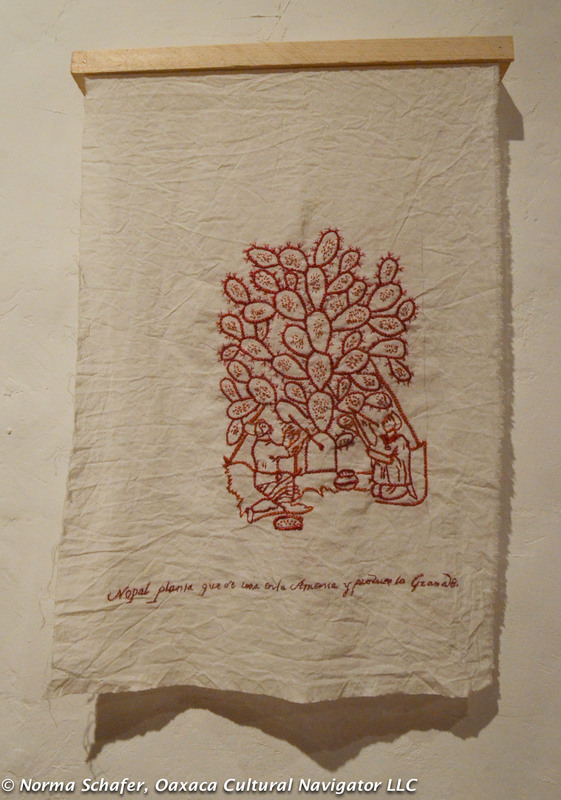 But there is more than meets the eye: tone poems of color embroidered onto cloth that tell of the modern experience of traditional color in a changing, mechanized world. What does blue evoke? How does red make us feel? What is the human labor needed to give us these colors that we take for granted and enjoy? 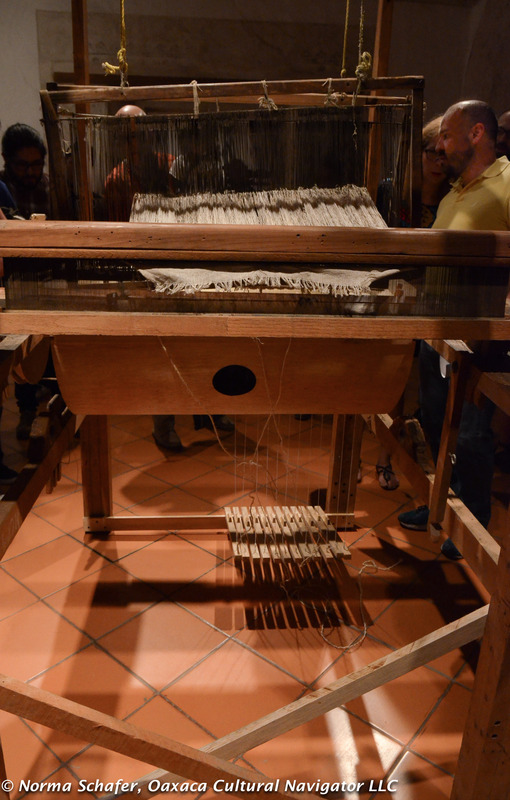 As the crowd gathered around an ancient loom converted into a sound box, people took turns cranking the take-up roll, traditionally used to wind the cloth as it is woven. In this structure, it turned the wheel to produce sounds. The “thread” was string — as in violin or piano. 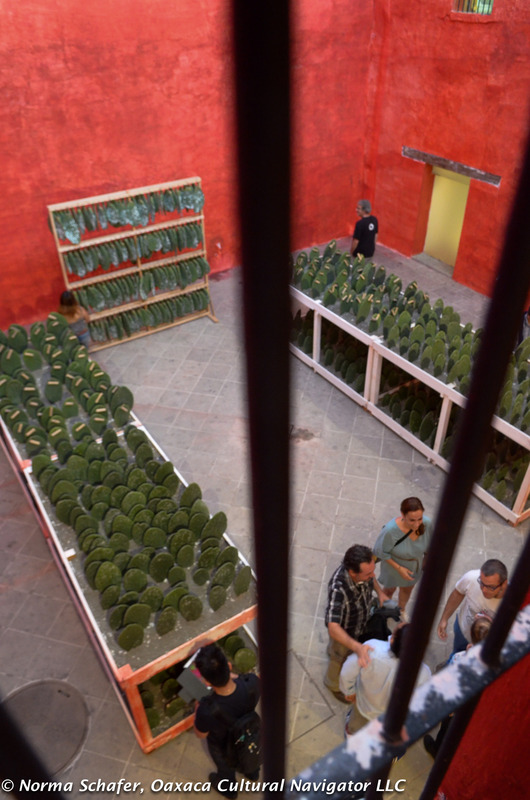 A cochineal painted room of breeding cactus gives us a sense of how many of these bugs are needed to color just one rug or garment. The color intensity penetrates. Questions? Did the exhibition go far enough? Were the exhibits as interesting as they could have been? 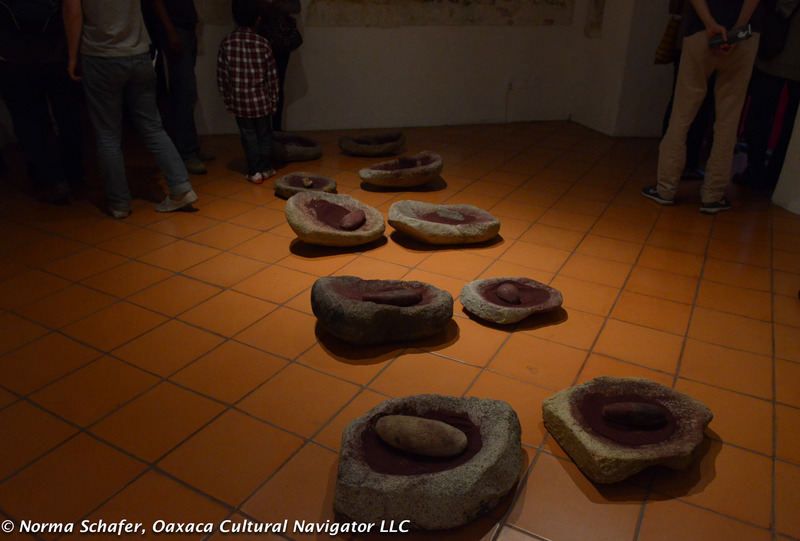 All the explanations were in Spanish with no English “subtitles,” so the meanings could be harder for some non-bilingual visitors to “get.” Was there a clear path to meaning from one gallery to the next? 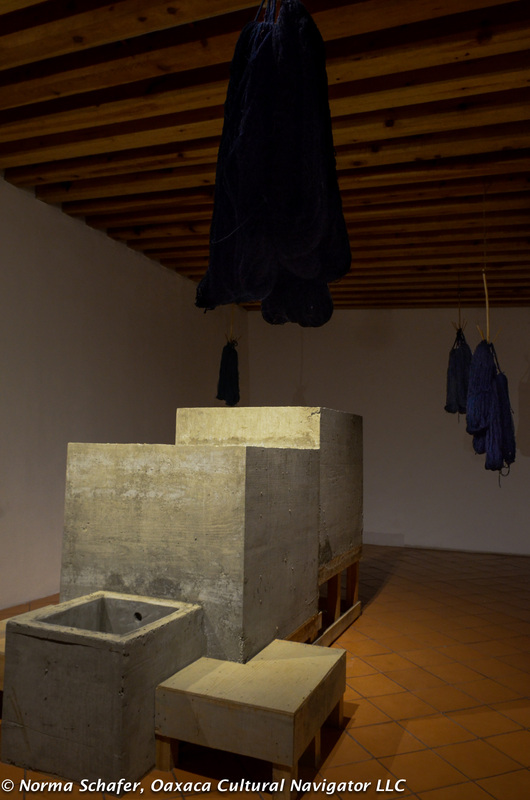 Moving from the preparation of cochineal to indigo, we see the concrete vats replicated to show us how the color of the plant is extracted. 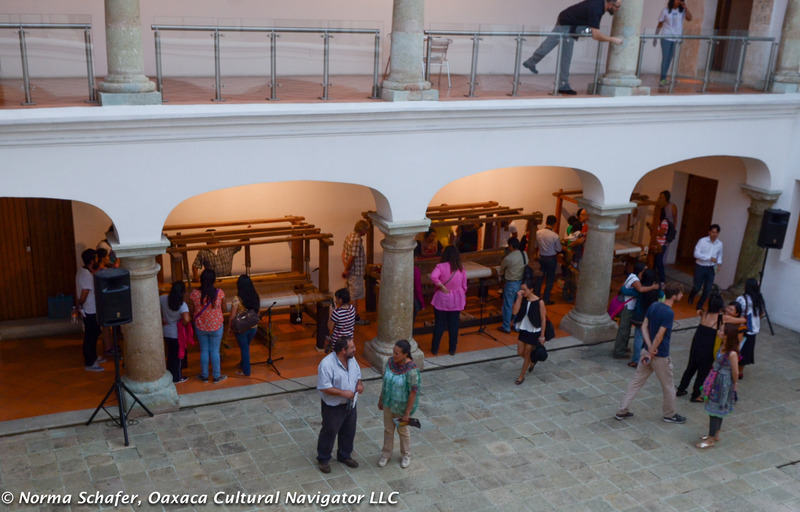 There is an excellent video created by Eric Chavez Santiago, education director at the Museo Textil de Oaxaca about the process of preparing indigo. It would have been a great educational video to include in this exhibition — better than the one selected to show. 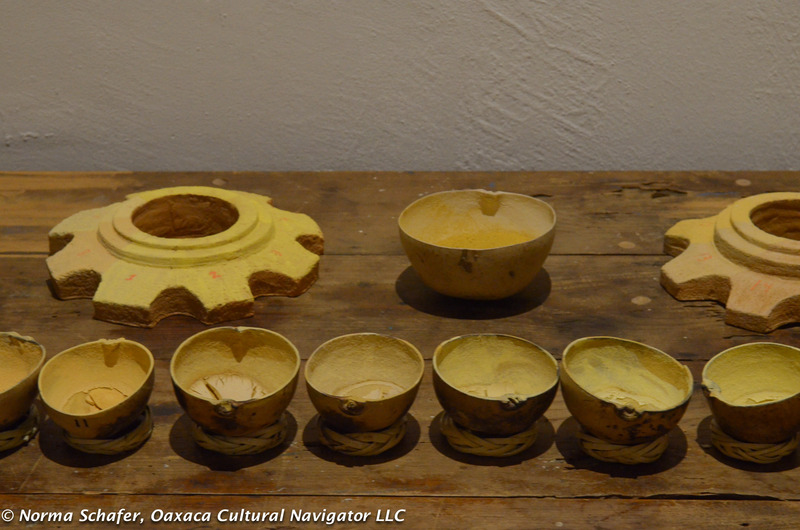 Ceramic artists from Santa Maria Atzompa created bellowing birds in the “yellow” room. Push and pull the bellows to hear how sound emanates and enters our bodies for interpretation. Aren’t we all cogs in the wheel? Meaning comes from many sources. 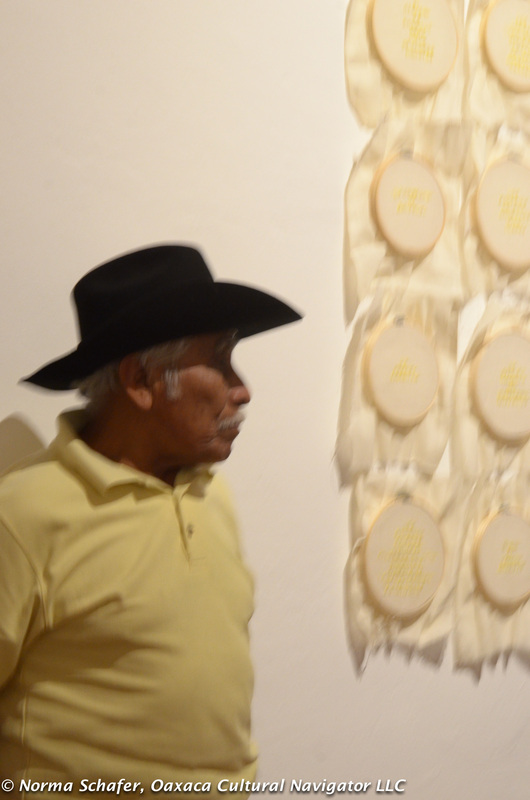 The exhibition raises questions about how technology impacts and changes people, traditional life, practices and uses. How many are using the metate now to grind the cochineal and indigo, when most have gone over to coffee grinders for ease of labor. Does this change the outcome of the fiber and color? 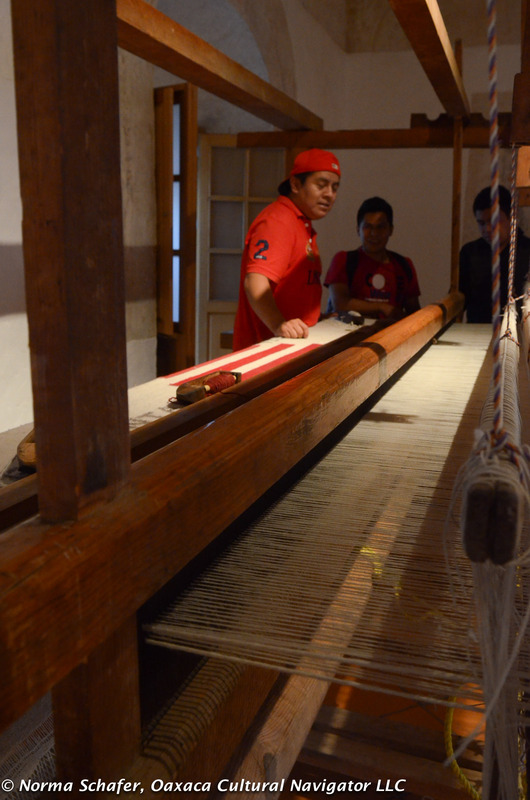 What about the practice of hand-weaving itself? 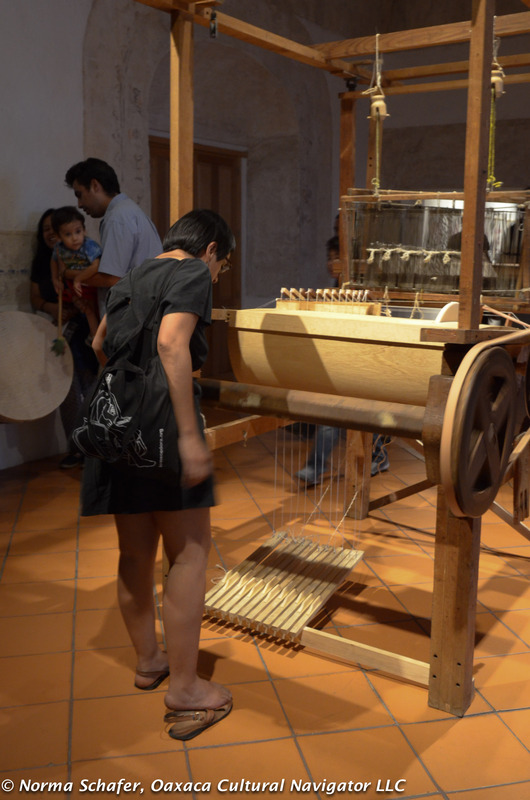 Will automated looms result in lower prices, yes, and the disappearance of a handmade process, perhaps? Will people only do this for a hobby and not for a business or way of life? What does it mean for the continuation of culture to experience this change? 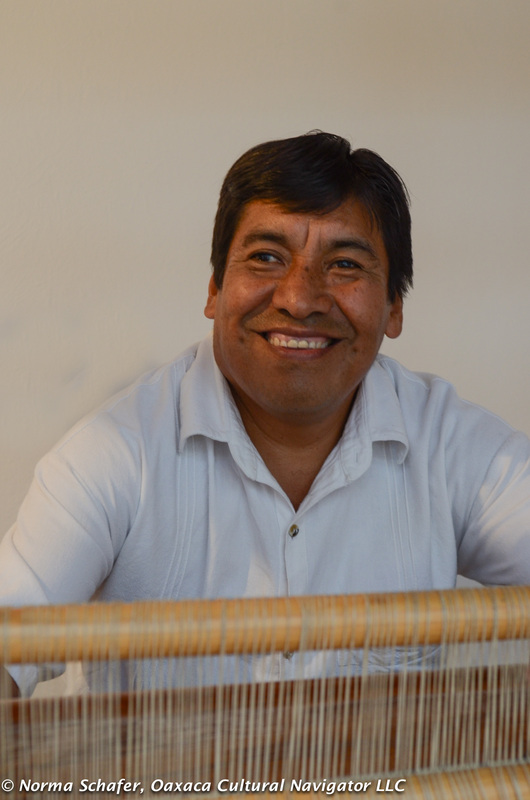 What about the raw materials: The hand-spun wool and natural dyes, what will become of them and the people who make them? I presume these are the questions that the artist is asking us to explore in this exhibition. As supporters, appreciators and consumers of art and artisanry, how do we each contribute to the continuation or demise of hand craft? 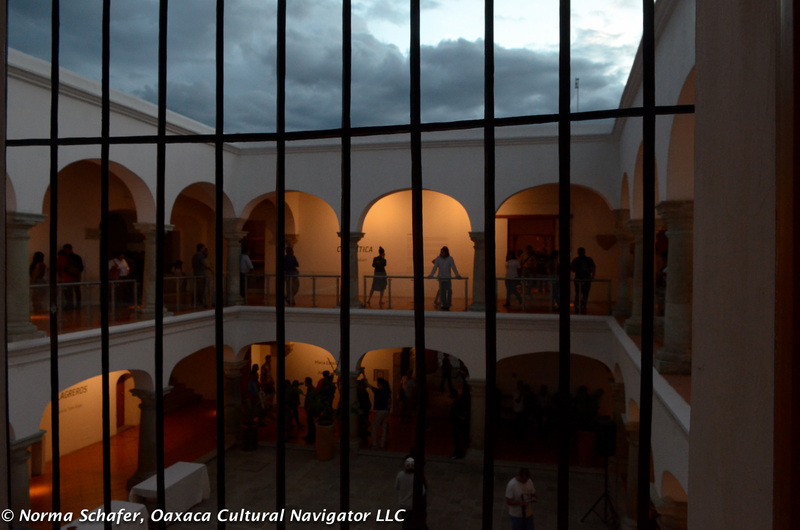 The contemporary art museum is located on the Andador — Macedonio Alcala between Murguia and Morelos. 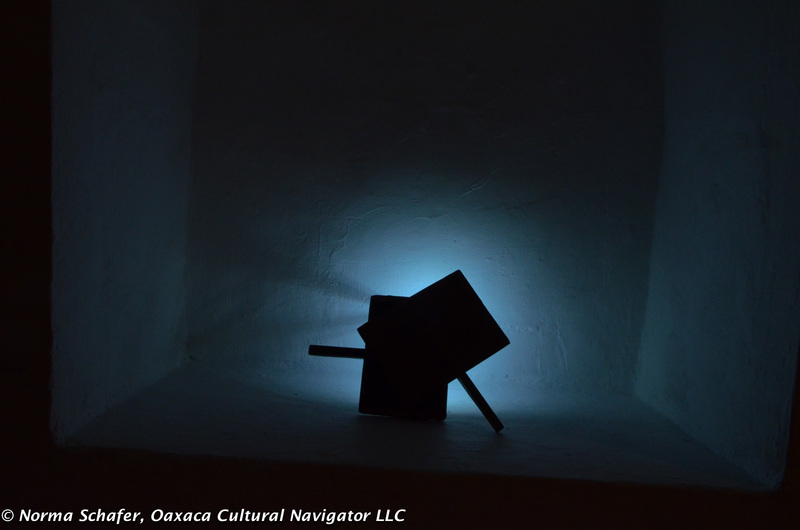 This entry was posted in Cultural Commentary, Mixed Media Art, Oaxaca Mexico art and culture, Photography, Travel & Tourism and tagged art, chromatics, critique, culture, exhibit, MACO, Mexico, Oaxaca, photography, review, sound, Tania Candiani, technology, weaving. Bookmark the permalink. 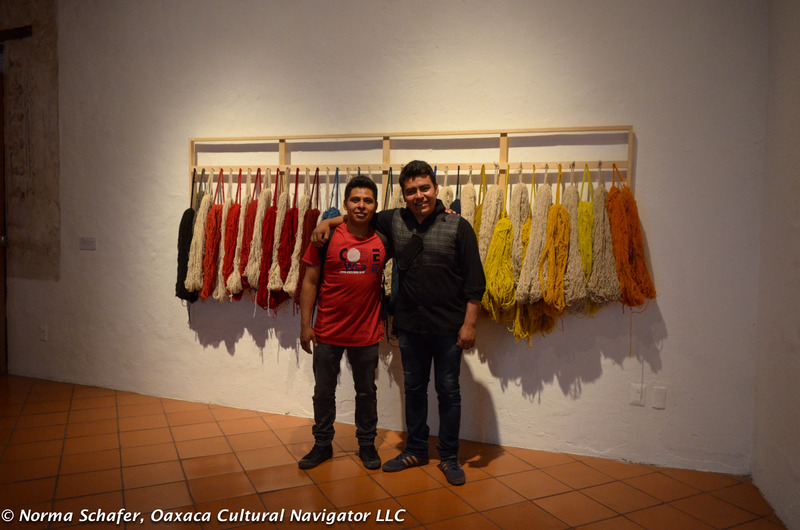 What are the dates of this exhibition as we are planning a trip to Oaxaca. Would definitely love to see this and more of the surrounding area.. Thank you for you prompt reply…. Peggy, I don’t know the closing dates. I’ll see what I can find out. Wish I could hear what you saw, Norma! Would also like to see the names captioned for the rest of your artist and family portraits in this piece,if they don’t mind. Lovely! Gracias. 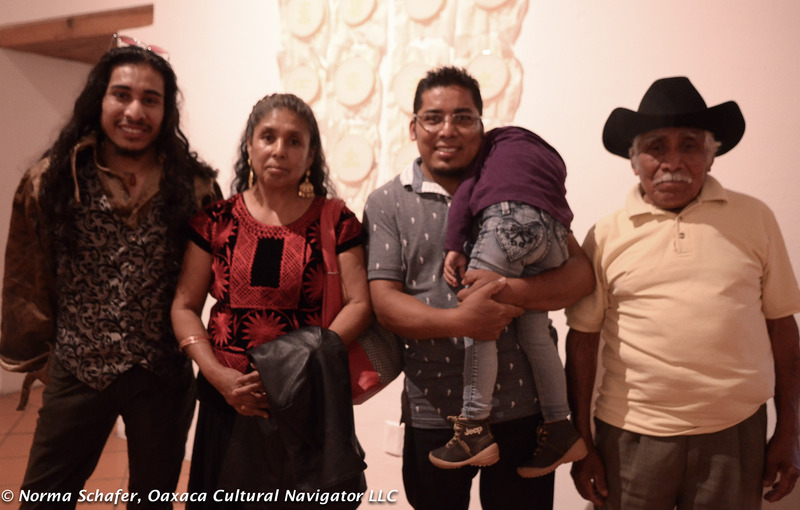 Sounds like something we will want to see when we are back in Oaxaca. Thanks for sharing with us. Thanks to you both. Yes. Well worth the visit.